Teachers know that they must diversify their instruction if they want to reach all their students. In many classrooms there are divergent learners, special education students, learning disabled and many levels of English language learners. How can a teacher teach the subjects to all of them at the same time? This book is also good for adult citizenship classes and Adult Basic Education classes with students with low literacy skills and/or limited English skills. The reading and exercise levels vary from 1.5 - 3.5 (although the content is covered in 5th grades and higher). It is suggested that these be used when the on level or nearly on level student do the textbook readings and activities. 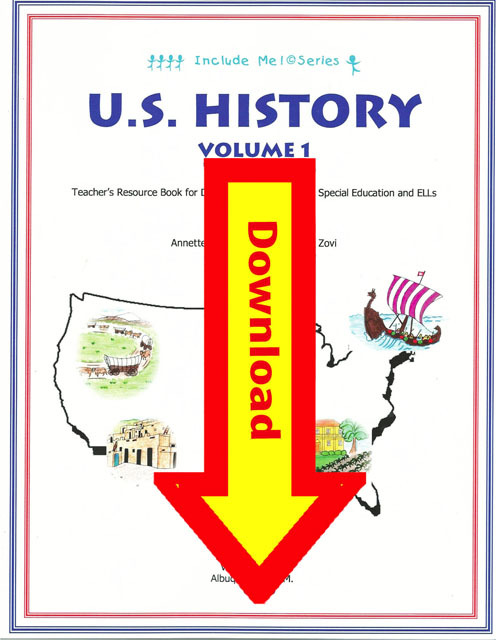 This is NOT a substitute for the regular textbook or curriculum, but a resource of ready - made readings and activities that students of all levels can learn from. All students should be, and now can be, included.